Note from GuitarAttack: This is a great story. Well-written and informative. Well, it's taken me a long while, but I'm finally getting down to writing this! It's been a good 11 months or so since I finished it, but I figure that gives me more time for testing and thinking about what I'd do differently! But more importantly, I wanted to write this as a bit of a thank you for all the people who have submitted their Saga sagas before me, all of whom I've taken a bit of inspiration and ideas from (and of course, learning from your mistakes!). So, this is a bit of paying it forward, in the hope that the people who are contemplating embarking on their own Saga saga can learn from my mistakes and maybe one day be telling other new Saga devotees how THEIR Saga saga played out! My Saga kit (J-Bass) was a Christmas present which came after much begging and pleading! First thing I did, as most do, is stick the thing together to make sure that everything fits. Couple of issues that I had with my kit- I reckon about six holes lined up, the rest were off. Took a little while with the wood filler and the drill to fix that one. 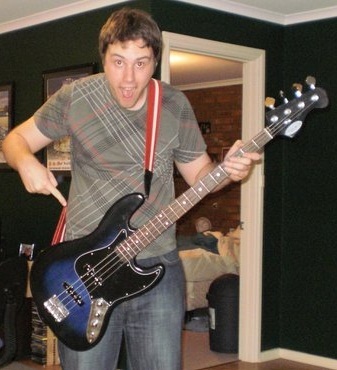 Also, on a Jazz bass, the big pickup goes near the bridge and the small pickup goes near the neck However, mine appeared to be routed around the wrong way around! More filler and a little bit of Dremel work fixed that! Having said that, the neck-to-body fit was spot on (no chiseling for me, thank God!) and everything was there. It's a bit of a lottery, apparently, as to the build quality of each particular kit, I've heard some are perfect, and some are scrap. I might be a sadist, but to me it was actually kind of fun having a few little things to fix before I went ahead and did the build! Whilst some just want a cheap bass to paint and stick together, I think half the fun's upgrading the parts in the kit to build your dream bass! So, after much scouring of the internet, a box of parts arrived at my door ready to be bolted on and incorporated into the kit. A pair of Seymour Duncan vintage Basslines Jazz Bass pickups, a black pickguard, some copper shielding for the pickup cavities and the electronics, and a blend knob for the electronics, but I'll get to that later! Add to that a substantial expansion of my power tool collection (I needed a jigsaw and a sander...! 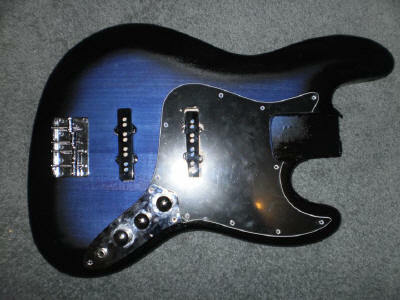 ), cost of paint and other finishing supplies, I probably could have had a Fender for what this cost me. No matter, they don't come with bonus power tools! Nice little trick that I learnt from a few people on the forums was to mix up a nice, dark version of your stain and give it a nice thin coat first up. Wait for it to dry and then sand it back. The stain penetrates the less dense bits of woodgrain first and deeper than the rest. Once you sand it back, it'll have a nice tiger-stripe effect and highlight the grain of the wood really nicely. Go over it again with the stain, and the dark areas will become darker while the rest of the stain fills the rest with the final colour. Once that had happened and I was happy with the colour, it was time for the black shadow around the outside. know that NOW, anyway! So once I'd sanded off the lumps of paint that had transferred their wrinkly disgustingness from my table to my bass, I was ready for clear coat and sanding! Electronics all got re-soldered and the cavities lined with copper foil. Still hums like anything, though. Guitar Shop Man said it was the front pickup, but I think it's an earthing issue (hums less when I touch metal. Note to self: take to a better Guitar Shop Man...). The blend pot is a substitute for the original electronics, now instead of volume, volume, tone, I have it set up as master volume, blend, tone, meaning that I can now cut the volume really easily if I'm playing in church and don't want to be making rumbling/thumping noises during the prayers (kind of embarrassing!). As for the neck and headstock, neck is stained black and then coated with an estapol furniture satin to keep a really fast matt feel (I hate shiny necks!). This is matched to a black faced headstock and custom decal. After all the hand-fitting I had to do, it's not like I was going to put the Saga decal on it, was I?! Decided on a custom decal a guy on eBay printed up for me (I can't print in white). Decal lines don't show behind the lacquer- perfect. Overall, I'm really pleased with how it turned out. After a good setup by Guitar Shop Man, the thing plays really nicely and it's been a whole 11 months of faithful, awesome-sounding bass action. It taught me a lot and I love being able to jam with it knowing that I was responsible for everything from beginning to end. It'll never be perfect, but it sounds damn cool, and it's MINE! This was my first Saga kit, and it sure won't be my last. I hope that this goes on to encourage a few more people to take the plunge as well. It's worth it! Great job, Chris -- Keep on building and send us more photos!